I have so many musical memories tied into Christmas and the holidays — not the least of which was finding my first real stereo next to the Christmas tree one year; the colored lights and tinsel reflecting softly out of focus in the dark plastic turntable lid which also sported a big red bow… It had been a selfish, teenage request made in a year when my father's gas station business was struggling through the 1973 oil shortage and I was, I'm sure, oblivious to the true impact any of that was having — especially on my father or the family's finances. I just knew I desperately wanted to replace my worn “close-and-play” styled record player and graduate up to the world of hi-fi stereo equipment. Of course, I really didn't even know what that meant because prior to my record player (the kind where the speakers fold out, the turntable folds down and you could stack as many vinyl records on the spindle—for continuous musical play—as you owned) the only other turntable in the house was my parents stereo and that was more furniture than hi-fi. (At the time, I'm sure it was regarded as “state of the art” for it's high-fidelity and sonic clarity, but years later it seemed like its most noteworthy characteristic was how many Hummels and picture frames it could hold) So when my father jokingly asked “If we were to get you a stereo for Christmas… what would you want?” I was absolutely no help at all. I didn't know a tweeter from a sub woofer or a direct-drive turntable from a pre-amp. My father knew even less so he enlisted the assistance of his good friend Kenny Kovatch who owned one of the biggest appliance stores in town. It was there, amidst gas ranges, refrigerators and rows of washers and dryers that my dad picked out my Christmas stereo: a one-piece Zenith with a turntable, AM-FM receiver and built-in cassette deck. There was no way to set and monitor the levels, but the tape deck would record any record playing on the turntable and any signal broadcast from the radio… And so it began. Long after everybody else had gone to bed, the fire burned low and the family room began to get cold. I lay on the floor in the glow of the twinkling tree with my head between the two 3-foot tall speakers. With the volume set somewhere between .5 and 1, I listened to all five records my Uncle Mike had given me after dinner (a story for another time). The music had never sounded so good. Somehow my father had come through. Thirty-three years later the music still sounds good to me (albeit on a much more sophisticated piece of stereo equipment)—alive with the magic and spirit of a Christmas full of sacrifice and generosity. Merry Christmas everybody. 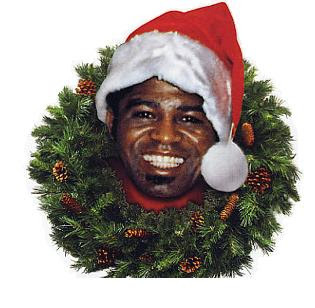 The Happy Medium Song of the Day is, appropriately, “Funky Christmas” by the one and only “Godfather of Soul,” James Brown who passed away today at the age of 73.